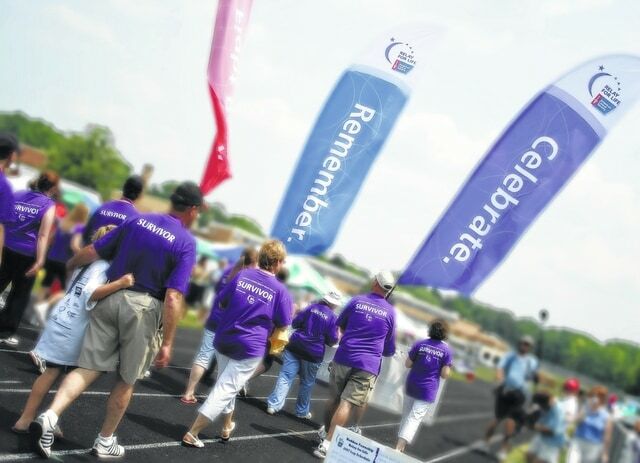 The Survivor Lap is one of the highlights of a Relay for Life event. This weekend’s American Cancer Society Relay for Life of Delaware has a new time and location. Last year, the event was at the Delaware County Fairgrounds. This year it was going to be at Ohio Wesleyan University’s Selby Stadium, but that’s been changed again. The Relay will take place at OWU’s Williams Circle, 7-21 Williams St., perhaps better known to locals as Fraternity Hill. The other change is with the time. Many Relay events start at 6 p.m. Friday, but Delaware decided to try something new this year. The Relay will begin at noon Saturday, and conclude at 6 a.m. Sunday. Nicley said some events will take place earlier than usual, including the Fighting Back ceremony at midnight. However, the popular luminaria ceremony will still be at 10 p.m.
To date, 17 teams and 73 participants have raised $21,246 for the Relay. Nicley said the Delaware Relay has raised nearly a million dollars since it began in 1997. At the City Council meeting Monday, Mayor Carolyn Kay Riggle named June as American Cancer Society Relay for Life month. According to the American Cancer Society, more than 67,000 new cases of cancer are expected to be reported in Ohio this year. However, the death rates have dropped 22 percent since the 1990s, and the five-year survival events has increased since the 1990s.